Scene on a TT scale (1:120) diorama showing a German series 772 railcar leaving the Finsterwalde station area on it's way to Lichterfeld. 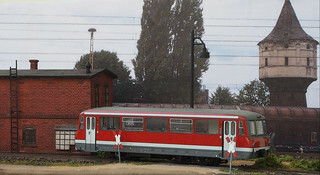 That motor car with the number 772 342 is owned by the train operating company LDC (Lausitzer Dampflok-Club = Lusatia Steam Locomotive Club). It was the only copy of that series that still got the red DB Regio paint scheme. A model of this car with exactly that number is available as a TT scale model from manufacurer KRES.